To produce precision parts and components needed for defense industry applications, the most advanced manufacturing techniques are required. Innovative Metal Designs (IMD) delivers high performance, tight tolerance parts for the defense industry, utilizing state-of-the-art equipment and extensive experience to provide some of the finest CNC machining, milling, and sheet metal fabrication California has to offer. IMD produces a broad range of parts, components, and turnkey products for defense applications, from combat/field workstations to electrical boxes for nuclear submarines. Our computer-automated CNC equipment provides exceptional accuracy and repeatability, whether you need prototype parts or full production runs of 5,000-plus pieces. No matter how intricate the design, we can meet your exact specifications and deliver parts with tolerances of ± 0.001” or better. 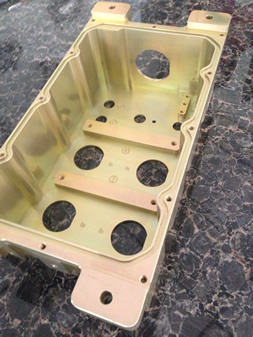 We work with a number of materials to meet our customers’ needs, including aluminum, carbon and stainless steel, advanced plastics, copper, and brass. Other specialty materials may be available upon request—please contact IMD with your unique material requirements. Request a quote today on custom aluminum milling, stainless steel turning, or other CNC services for your defense industry application—most quotes are returned within 72 hours. Or, contact us to learn more about our precision manufacturing capabilities.